We all know that shopping online has taken over the way companies do business. But what you may not know is that shipping options can make or break the deal for the majority of buyers. About 85% of Amazon users won’t buy a product because of the shipping charges. Then 60% of Prime users won’t buy your product if the shipping is too slow. How do your delivery options stack up? You are probably missing out on a lot of sales because your delivery options aren’t what shoppers are looking for. Let’s go over the delivery options that you have available to you. First things first, no matter what shipping options you offer your buyers, you must provide tracking. Your customers want to know when their order ships and when they can expect it. In fact, they are more likely to be happy with a longer shipping time as long as they know when the delivery will happen. By offering them an online portal to track their shipment you give them a higher level of communication and build trust. Amazon has proven that some customers want their items fast. In fact, there is a whole community of Prime members who pay a yearly fee just to have two-day shipping on all of their orders. Sephora has followed suit and they offer a yearly membership of $15 to get their FLASH shipping. That’s free 2-day shipping on all orders. 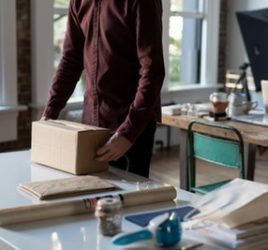 The advantage for you is that these customers are more likely to order more product because they know they have free shipping. You don’t have to offer a membership to offer rush shipping. This will be a more most expensive shipping option, but your customers will expect that. This option is about service and speed, not price. You need to provide a low cost or free shipping option. This will cover all of your customers who don’t want to pay for shipping. Now this means that you need to cover the shipping cost yourself. You could build the cost of shipping into the price of the product. This isn’t always possible though. Your other option is to reduce your shipping costs. One way to do this is to work with a shipping service that provides warehousing. You would then hire them to store and ship your inventory. This does two things for your business. First, it reduces your shipping costs by streamlining the process. It also reduces costs by allowing you to leverage the shipper’s volume for lower rates. The second thing it will do is place your product closer to your future customers. Think about it this way, if your company is in Florida, but most of your customers are in New Jersey, then they have to wait for their order to go from Florida to New Jersey every time they order. Instead, have your company in Florida, but warehouse your inventory in New Jersey or nearby. Then when a customer orders it only travels a short distance, getting to your customer faster. Another popular option is in store pickup. 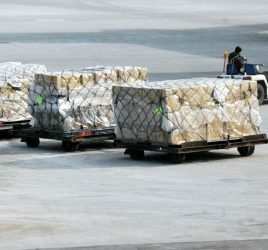 Walmart and Target have been leaders in this type of shipping service. It works well for your business because you already have the logistics infrastructure in place to support it. It can also streamline your inventory management since the product may not even need to be shipped. It may already be located in the store. There is also the added benefit of getting your customers in the store. This increases the likelihood of buying more once in the store. For those who do business online and in brick and mortar locations, this is an option that should be embraced. About 60% of shoppers aged 15 to 49 would be happy to have and want to use this service. If you are in the business of shipping large items then carrier or parcel shipping isn’t for you. 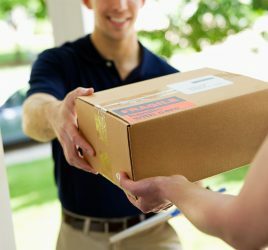 In this case, you can provide your customers with the highest level of customer service by arranging shipping for them. If you work with a broker you ensure that they get full service at the best price. Your customers may not know that they will have to pay extra for last mile and in-home delivery. You can get the best rates for both of these by leveraging your broker’s shipping volume. This also takes all of the headaches and work out of the buying process. Your customers will appreciate the prompt on-time delivery. This type of service is what will separate your business from your competitors. You don’t need to give buyers all of the delivery options that are out there. You just need to offer a couple of different options. This will allow you to cater to the needs of a wide range of shoppers. You want to have one low-cost option. This will cover those who don’t care how long the shipment takes, they want the lowest cost possible. Then you want a mid-grade option, people who are willing to pay a little bit to get their item slightly faster than the cheapest option. Many buyers will choose this option because it seems like a better option. Finally, you want a fast shipping option. This is for those who want their item RIGHT NOW. These shoppers are willing to spend extra money to make sure they get their item as fast as possible. With these options, you are sure to have something to satisfy the biggest amount of people. Contact us today and let us help you formulate your shipping strategies.